If you had asked me when I was a first year in college, would I personally have worked in politics or run for office, I would have laughed, like hysterically. Well the joke was on me, three years later, I ran to be Vice President of the Student Council at my University. I was compelled to be part of changing how things were done on campus, and the only way to do that was to run for leadership in student government. I had no idea what I was doing, was TERRIFIED of public speaking to the point of shaking, and while I volunteered and organized events on a committee for Student Council for 3 years, I worried people would doubt my qualifications, but I set my mind to it. Little did I know that that experience would begin to lead me away from a career in journalism and toward a career in politics and public service. Recently, perhaps with women like me in mind, Emily’s List, a PAC dedicated to encouraging and electing pro-choice Democratic women, launched their new campaign to help elect a woman to the highest office in the land, President of the United States. Regardless of political affiliation there is still a gap in political leadership for women but the ground is shifting. Despite Hillary Clinton not winning the Democratic nomination in 2008, her run did leave 18 million more cracks in the ceiling to the highest-ranking public office in the US. And it appears so did Sarah Palin, with her run for Vice President on Republican John McCain’s 2008 Presidential ticket. After the election in 2008, it didn’t seem extraordinary for women to put their names forward to be considered for President. Michele Bachmann expressed interest and did run for President in the 2012 Republican Presidential Primary and Sarah Palin toyed with the idea of running herself. In the year of 2013, we have 18.5% representation of women in Congress. 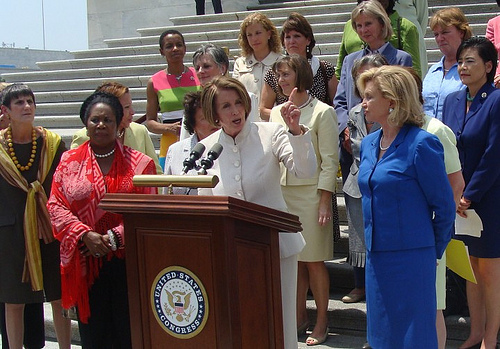 While there are many women’s organizations dedicated to recruiting, training and encouraging women candidates to run for office that have been instrumental in game changing the arena for women in politics like the National Women’s Political Caucus, Women’s Campaign Fund, or Emily’s List the gap is not decreasing significantly. Why? Current Director of the Women & Politics Institute at American University and Associate Professor of Government Jennifer Lawless researched this for a 2008 Brookings Institution report, “Why are Women Still Not Running for Office?” Her report reviews women in the highest tiers of their professional expertise Men enjoy more encouragement and confidence and support to run for office. “Women are less likely than men to be willing to endure the rigors of a political campaign. They are less likely than men to be recruited to run for office. They are less likely than men to have the freedom to reconcile work and family obligations with a political career. They are less likely than men to think they are “qualified” to run for office” the report stated. I’ve seen this all play out in many different scenarios working on campaigns for many women candidates, volunteering in the community, and advising other women who are thinking of running for office. I know this feeling myself. A young woman who was the Virginia Young Democrats President at the time recruited me to run for a state officer position in the Young Dems. Though I was thinking of it, I was greatly buoyed by her encouragement. Years later, I went from the state chapter leadership to the national level in the Young Democrats of America, (YDA) an organization who can count among its alumni, Congressman Barney Frank, Minority Whip and Congressman Steny Hoyer, and Congressman Jim Clyburn. I now serve as one of YDA’s National Vice Presidents and I’ve embarked on a new journey, running to be President of the Young Democrats of America. In Facebook COO’s Sheryl Sandberg’s book “Lean In” she discusses why she thinks women achieving leadership roles across the various sectors has stalled. The key premise in her various offered solutions is that women need to “lean in” to life’s opportunities not step back. For me, I took a deep breath and believed I had a right to take a seat at the table of leadership like anyone else. Too many women have fought for our right to vote and be considered equal citizens in society to not take that seat. So women don’t be afraid to claim that seat. Don’t be afraid of campaigning you never know what you’re made of until you try. Turn to others who’ve done it before for help. Go to campaign trainings. Seek counsel from others. I’ve counseled many other fellow young women who’ve run for public office or run for party leadership positions. And many have counseled me along the way. Studies show that women need to be asked a total of seven times before they will consider running for office. Don’t wait to be asked. Don’t get me wrong, it’s flattering to be asked and considered. But men don’t wait to be asked. Seriously, if I had a nickel for every guy I knew in college who wanted to “Guvnah of V-uhgini-ah” I’d have paid for half my tuition easy. If you have demonstrated commitment, and you think you have perspective to bring to the table and you think you can make a difference, well by all means step up. Have some faith in yourself, because no one else will, if you don’t. Sheryl Sandberg also emphasized the need to make your life partner a real partner. “The single most important career decision that a woman makes is whether she will have a partner and who that partner is. I don’t know of one woman in a leadership position whose life partner is not fully—and I mean fully—supportive of her career. No exceptions” I CANNOT agree more. I would not have made it this far in my life working all hours on political campaigns or traveling around the country running for a national position in a national political organization if I had not had the unyielding support of my fabulous husband. I urge fellow young woman with their eye toward public office to seek partners who are as equally supportive of their ambitions as you would be of theirs, especially straight women. Straight men for years have sought wives that are perfect “political spouses”: a steady rock who is supportive of their ambitions, and is able to spend more time helping to manage the family. Straight women, I strongly encourage you to settle for no less either, because they wouldn’t. I often look to the past and think of the women who rose to leadership in much harder and legally restrictive times to be a woman and I am inspired by Ann Richards or Shirley Chisholm and so many others. We are the generation that has the privileges and power that the women before us never commanded. Let’s be fearless and use it. Phenomenal piece, thank you! I’m constantly hoping to find more women to vote for on my ballot. I’m proud to have Congresswoman Doris Matsui as my representative, and I love knowing that BOTH my Senators are women. Having said that, however, I’m still shocked that my great state of California has yet to elect a woman governor. And to be honest, all our future hopes basically rest with AG Kamala Harris. That frustrates me as a feminist and as a father to an awesome 13-year old. We have amazing state legislators like Mariko Yamada, Joan Buchanan, Toni Atkins and Ellen Corbett, yet no one ever makes that gubernatorial leap. And to know that only ONE governor out of 50 happens to be a female Democrat is flat-out embarrassing. Here’s hoping the horizon looks better in 2014 & beyond, thanks in part to you Atima!